Your mattress is built new at the local factory when you order and delivers directly to your home within 3 to 4 business days. CLICK HERE if you need it sooner. We know our material sources. We're working hard to reduce our carbon footprint. And, we know the names of each person who sews each stitch. The Harbor is the result of months of research for the highest quality latex materials. The process assures the best, most durable and resilient latex. Our soft natural cotton cover is harvested from renewable resources to complete the 12-inch flippable mattress. 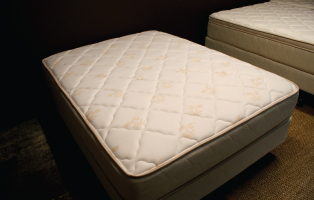 The ultimate in luxury, the Atlantic is a foam encased NoFlip® EuroTop mattress featuring a high coil count innerspring unit, conventional and convoluted high-density SuperSoft foam upholstery layers, and 3 inches of the finest cooling gel memory foam directly under the quilted panel in the EuroCore. Fans of memory foam will rejoice: our blue cooling gel has been blended into the foam to create the truest, coolest memory foam sleep experience. PREMIUM Flippable PillowTop - A unique plush double-sided pillowtop. The 15" height encases a solid structure and is covered with hand-fitted upholstery stitched and fastened for durability and comfort. This design offers the plush comfort of a pillowtop coupled with the life-lengthening option for flipping. Foam encasing keeps the edges tight and keeps motion at a minimum. For those looking for the plush comfort of memory foam but with a SuperSoft EuroCore, the Lockwood specializes in gently layered high-end foam that is built to last. Like the Atlantic, the same solid high coil count spring unit construction makes for a restful and pampered night's sleep. Foam encasement rounds out the Lockwood's long list of features. The Charleston Mattress' answer to the very popular all foam mattresses. Before you spend $4,000 - $6,000 for a name brand, come try The Ocean 12". This mattress offers all the comfort and luxury, without the buyer's remorse. A plush all foam option offering comfort comparable to its $3,000-$4,000 big brand competition. You'll sleep easy because (1) you saved thousands and (2) this mattress is ridiculously comfortable. This has quickly become our most popular mattress set. The Beaufain Firm was built in response to clients who adored the construction of the exquisitely crafted Beaufain Plush, but longed for something, "Just a bit firmer". The wait is over. This is the bed that your grandparents would have been proud to invest in. It's flippable, foam encased, and employs a high coil count spring unit system. 13" The firmest around. Come see for yourself. We challenge you to find a firmer, sleepable mattress anywhere. The Beaufain ULTRA Firm has been developed based on the wants of the International Traveler who often ask to match the firmness of bedding abroad. The factory's Finishing Team adds an additional firming pad and pulls it tight before the quilting goes on. The result, a masterpiece reflective of 100 years of bedding experience and listening to our clients. If you love a firm mattress you have to try The Beaufain ULTRA Firm. The Beaufain Plush is a classic. Its flippable, durable design includes a high coil count spring unit. Where other manufacturers might secure their fabric once every six coils, ours are secured at every other coil. This, along with foam-encasement, the highest quality foam (sourced from the USA), and a 10-year warranty written plainly in large print, makes the Beaufain a beautiful cornerstone in our line-up of high-end mattresses. Dunlop Latex - The Montague has many of the qualities that attract people to latex mattresses, but without the big price tag. It combines a premium Dunlop Latex top layer with a higher density core foam. No coils means little to no bounce. You're not seeing things...those borders are blue suede. 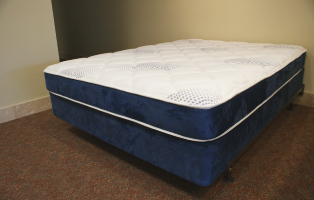 Come try this model, or our Dunlop Latex Harbor Mattress today. Flippable - A unique plush double-sided pillowtop with medium coil count. The 14" height encases a solid structure and is covered with hand-fitted upholstery stitched and fastened for durability and comfort. This design offers the plush comfort of a pillowtop coupled with the life-lengthening option for flipping. FIRM Flippable - This beauty combines the desired firm density with supple upholstery stitching to maximize durability. Thirteen inches tall, this medium-coil count structure is designed to withstand years of use, all the while providing superior support. Firm never felt so good. The plush, no-flip Eurotop combines with a medium coil count center to reach a classic 13" height. The entire quality core is covered by a designer knit fabric. Ideal for those seeking luxury at an attractive price. Flippable - The Beach House Mattress is a flippable, durable option great for those looking for comfort in sleep and price. This mattress works well as a primary mattress, or for filling up secondary bedrooms or secondary homes. You and your guests will agree that The Beach House Mattress was a great choice at a great price. Flippable - This lady in red is a traditional comfort value innerspring that features a medium coil count structure in a flippable design. The burgundy damask cover comes with a matching foundation that sets it apart from other beds. Flippable - The Cooper is a staple in many Charleston homes. We tip our hats to the flippable, sturdy favorite of past and future generations. No Flip - This is the one-sided Cooper. While it's not flippable, this mattress is only seven inches, making it convenient for bunk beds and other narrow spaces. It's a reliable value option.